600W LED Panel Grow Light. View Angle: 90 degree Reflector 9 Bands for Indoor Plants Growth & Flower Spectrum of Light: 28pcs 660nm 16pcs 640nm;8pcs 440nm;4pcs 460nm;4pcs 470nm;2pcs 525nm;2pcs 730nm. The life of the lamp is more than 15000 hours. High Luminous Efficiency by reflector cups Revolutionary. Best Color Ratio and Luminous Efficiency of Our LED Grow Light. Patent Optical Reflector Enhance the Output of Par Value of LED Grow Light. Best Heat Dissipation for the Best Stability and Longest Lifetime. Suggested Continuous Working Time: 1016 hours per day. Recommended Height to Plant: 0.5-1.2m according to different growing stages. 1 x 600W LED Grow Panel Light. 1 x Stainless Steel hanging kits. Our grow tent has all stable construction, 600D oxford cloth outside and 96% highly reflective waterproof diamond Mylar inside, with exterior zippers design ensure safety use and easy to set up. And it also has multiple vents to accommodate fans and filter. Great for you to grow exotic fruits, herbs, vegetables or seasonal fruits out of season. We promise to provide you with the highest-quality hydroponics equipment and services at our factory-direct prices. Inside: 96% highly reflective waterproof diamond Mylar(enhance the reflective effect) Outside: heavy duty 600D lightproof oxford cloth Frame: diameter16MM white paint coated metal rods Connector Material: 16MM (diameter) sturdy connectors Large heavy duty Zippers & Double Stitching for protection against light leaks. Rectangle vents with mesh for better ventilation Multiple vents for fan and filter output Quick tool-free installation. 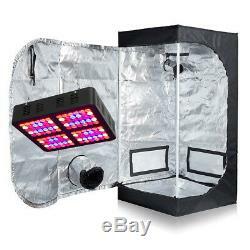 (for 24''x24''x48'' grow tent w/ green window). Instead of disturbing your plants controlled sleep / wake cycle, Observation Window allow you to monitor and assess your plants without disrupting their environment. Great for those of you who like to keep a beady eye on their plants. The technology utilises a formulated green tint which filters out white light so plants can continue their current state without interruption whilst you view your plants, amplifying your plants energy store and limiting the impact your internal growing environment. It provide a stable and continual environment for growing, encouraging plants to reserve and retain their energy store, maximizing productive growth. Multiple vents for fan and filter output Quick tool-free installation. 1x 96% reflective Growing Tent Cover 1 set frame of rods and connectors 1x Removable Water-proof Floor Tray Nylon Belts can be used for Filter Straps 1x Assembly Instruction. The item "600W LED Grow Light + 600D Grow Tent withPlastic Corner Hydroponic System Kit" is in sale since Wednesday, May 3, 2017. This item is in the category "Home & Garden\Yard, Garden & Outdoor Living\Gardening Supplies\Hydroponics & Seed Starting\Hydroponic Systems". The seller is "growsolution" and is located in CA/MD. This item can be shipped to United States.